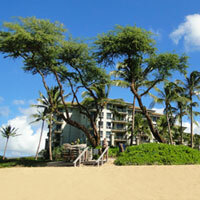 The elegant white Fairmont Kea Lani Maui is strikingly different from other resorts on the island. The Hawaiian feel of this 4.5 star award-winning Wailea beauty has unique Spanish influences that aren't seen very often in Hawaiian resorts. 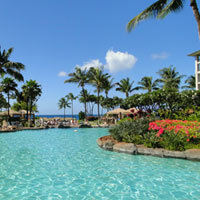 Also unique to the Fairmont Kea Lani Maui is that it is the only luxury all-suite and villa oceanfront resort in Hawaii. The luxury villas are truly a sight to behold - they're the size of a modest home, ranging in size from 1800 to 2200 square feet! Situated mere steps away from Polo Beach, they feature their own private patios, with a plunge pool and full-sized BBQ - these private havens in paradise are perfect for getting away from it all! The 1-bedroom suites aren't too shabby either! 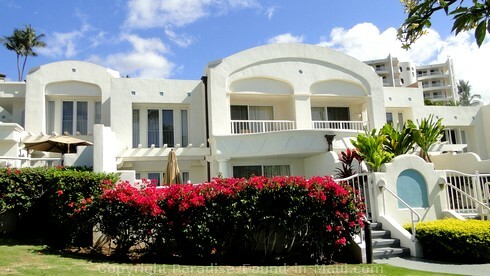 They're the size of a nice apartment with 840 square feet of space, plus a furnished lanai. They can easily accommodate a family of 4 if need be. The full service Spa Kea Lani is the ideal place to pamper yourself. They offer a full range of spa treatments, including facials, wraps and massage. 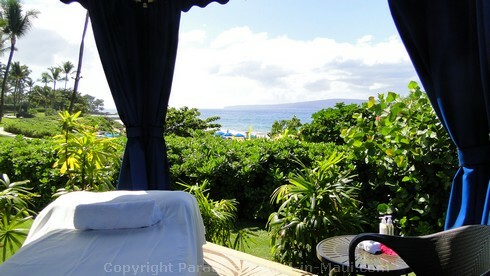 Their new oceanfront spa cabana is also available daily for both individual and couples massage. What a delightful spot to enjoy such a treat! 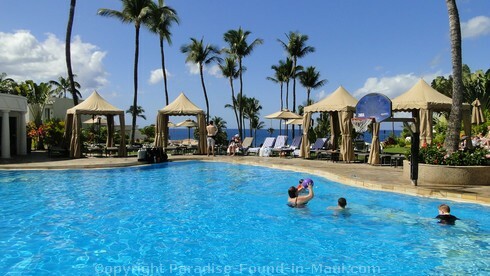 The Fairmont Kea Lani Maui has 3 swimming pools: the adults-only pool, plus 2 others that are connected by a 140 foot waterslide. Poolside drinks and appetizers are available from the Polo Beach Grille & and swim-up Bar. If the kids need a break from fun at the pool and beach, the Keiki Lani Kids Club will do the trick! This licensed child-care facility for ages 5-13 offers a wide range of crafts, games and cultural activities to keep little ones busy while mom and dad take a well-deserved break. There are several on-site restaurants here to suit every mood, ranging from fine to casual dining. Ko offers a sophisticated lunch and dinner menu inspired by the mix of cultures brought together as plantation workers in Hawaii's sugarcane era. 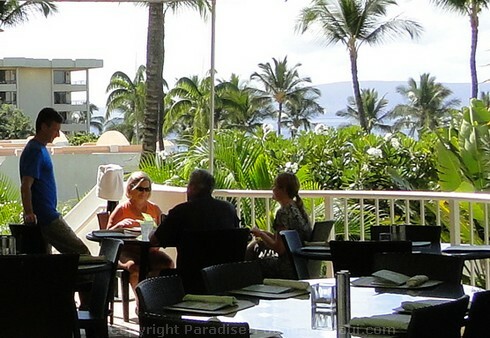 The open-air Kea Lani Restaurant opens daily with an an extensive breakfast buffet, plus a selection of a la carte items. Nick's Fish Market sounds rather unassuming, but don't be fooled! This seafood restaurant has won numerous awards, including Honolulu Magazine's "Best Restaurant" (silver) and Wine Spectator Magazine's "Award of Excellence." They are open for dinner daily. Caffe Ciao Bakery & Deli is open daily from morning until late night. Lastly, the Polo Beach Grille & Bar is available for casual poolside dining. The swim-up bar is perfect for a cool smoothie or tropical cocktail. The Luana Lounge is open nightly and is the perfect spot to unwind with a cocktail and appetizers as you enjoy the live local entertainment. Save With Hotel Packages from The Fairmont! 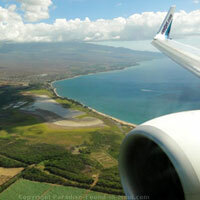 From Kahului airport, head down Keolani Place (route 380) - keep following it as it changes names to Kahului Airport Road and then Dairy Road. You'll pass a Costco and a Kmart. Just after you pass Home Depot, you'll see a large modern church on the corner - make a left turn here onto the Mokulele Highway (route 311.) The name will change to the Piilani Highway (now route 31). After about 6 miles the road turns to the right and becomes Wailea Ike Drive. At the end of this street, you'll make a left turn onto Wailea Alanui Drive. 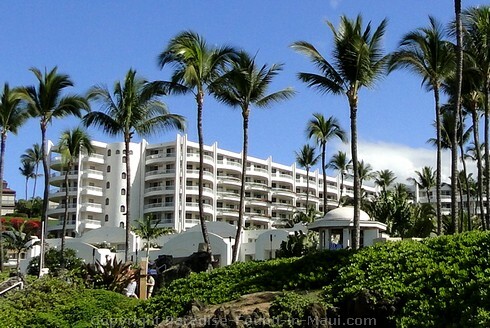 The Fairmont Kea Lani Maui Resort is located at 4100 Wailea Alanui Drive.